The first white man known to have resided in the Tippecanoe Township was a Frenchman named William Burnett who establish a trading post between the mouth of Burnett's creek and the Tippecanoe River. 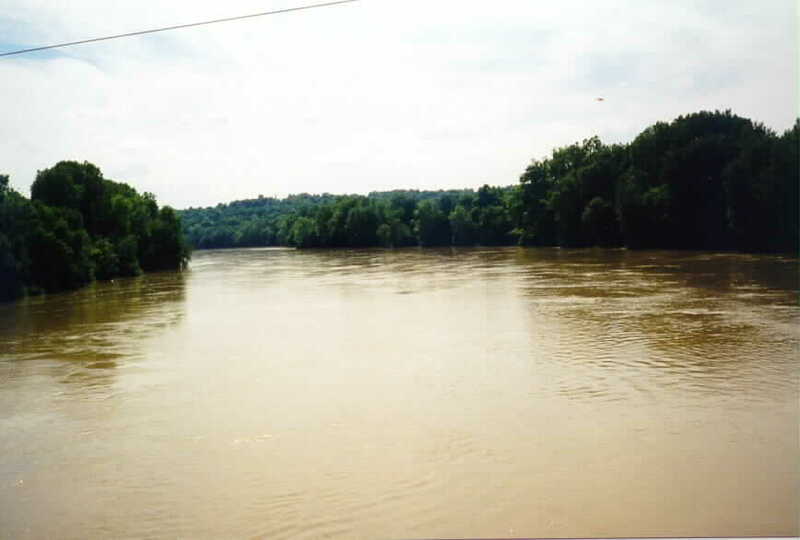 Burnett's daughter married John Davis who established a Wabash River ferry near the outlet of Burnett's creek in 1823. The bridge you are standing on was built in 1912, the ferry was in operation up until the bridge's construction. Davis Ferry Road, Tippecanoe Township. A View of the Wabash River from the Old Davis Ferry Bridge. "Davis Ferry. On a map, it appears as a placid little bend in the Wabash River. But history shows this point to have been the scene of activity since the beginnings of Tippecanoe County and source of controvery more than once. 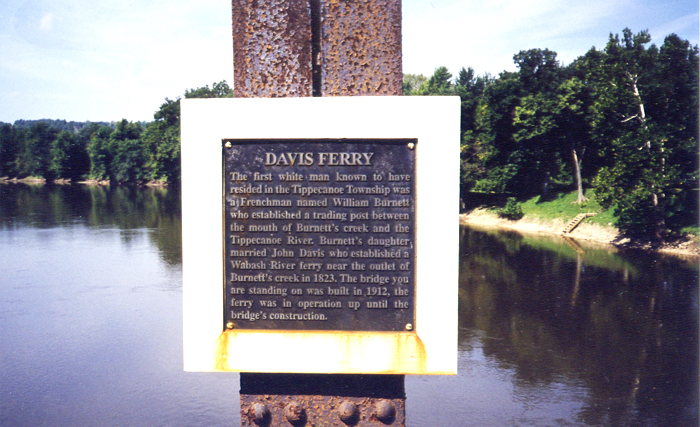 The story of Davis Ferry goes back to 1823 or 1824, when John Henry Davis settled on the north bank of the Wabash with his wife, Nancy Burnett Davis. Nancy, whose mother, Kaukeama, was an Indian princess, had come into possession of 640 acres of land in what is known as "Burnette's Reserve." It was the custom of the newly formed United States government to grant lands acquired from the Indians through purchase or treaty to the children of mixed marriages between Indians and whites. This was one means of rewarding the parents for aid and loyalty to the American colonies. The reserve had been granted to the children of Kaukeama and her husband, William Burnett. On the four or so acres of land bordering the Wabash at the particular bend, John and Nancy Davis built a log cabin, believed the first in what is now Tippecanoe Township. Davis set up a grist mill and a still. He also began operating a ferry. 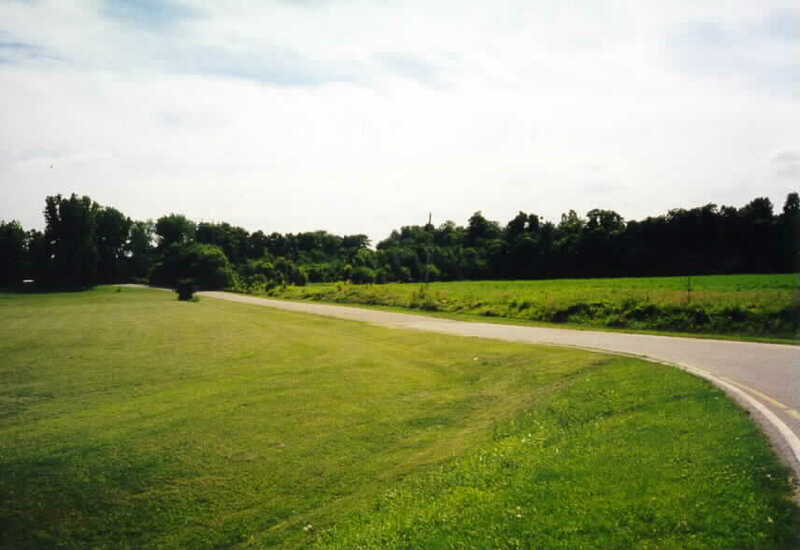 Then, as now, the crossing served as the only direct link between Lafayette and Battle Ground, as well as the northern part of Tippecanoe County. In those days, it also was on the road to Logansport. The name Davis Ferry has stuck with the location right up to the present, though the Davises are long since gone and a bridge has replaced the ferry. John H. Davis manned the operation only about seven years. He died July 30, 1830, at the age of 43, followed three months later by 31-year-old Nancy. The pair left behind two small sons, Richard H., aged 7, and his older brother, William B. The death of Davis and the threat of the demise of ferry operations evidently was of grave concern to county residents. On March 2, 1830, during Davis' last illness, 20 some citizens presented a petition to the County Commissioners asking that the ferry be kept in operation somehow. "Wee the undersiners think it is gratly needed, for thar is times in the year that his river cannot be crossed with ferrying. Wee think it will bee of grat serves to us and the community," the document said. Obviously a ferry in this key location could not be allowed to remain idle for long. So in 1831, the County Commissioners authorized Samuel A. Dickson to run it. Upon his death a little over a year later, the operation was taken over briefly by pillar of the community whose name seems to pop up everywhere in the county history of the era, Peter Weaver. Meanwhile, a man named Jacob Walker had been appointed guardian of the two Davis boys and their estate. Walker industriously set about to manage and invest the property to which the children had fallen heir. He saw to it that the ferry and the land produced income to bring up the boys and provide for their education. In 1838, Walker leased the riverfront part of the Davis property to Edmunds an John T. Huff, two brothers, who operated the ferry for four or five years. Several descendants of the Huffs still live in the Lafayette area, though not all bear the name Huff. The enterprising John T. Huff took advantage of a state law passed in 1844, making it legal for anyone owning land on a stream bank opposity a ferry to enjoy mutual privileges of that operation by charging fares for passengers embarking from his side of the stream. Huff bought the land on the south bank of the Wabash and , in effect, went into competition with the original ferry. It appears that a ferry was in operation at this site up until the building of the old Davis Ferry Bridge in 1912. Though the activity on the riverbank has slowed with the coming of a bridge, this crossing at a meandering bend in the Wabash River has been a vital link in the growth of Tippecanoe County for 150 years." The above is an article which ran in the Lafayette Journal and Courier, March 7, 1976, and was written by Dorothy Walden. Also see the story of The Burnett Family by J. Wesley Whicker, 1916.